I know this seems a little odd, and it was. 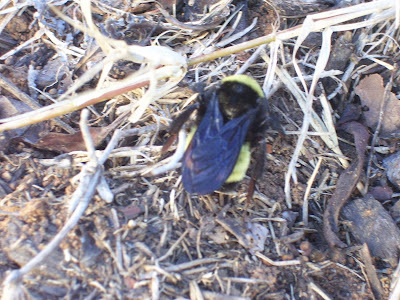 The boys and I were outside on the blanket one day in October, I look over at the base of a bush in our yard and here was this HUGE bubble bee. I really just stared at it for a few minutes, because it looked like a fake toy that you could find in our playroom. I really just wanted to see if it would move. OH, my goodness, it was beautiful! To give you a point of reference for it's size, it was about 2 inches long! It looked so sturdy, fuzzy and content just sitting there in the mulch. The boys and I watched it for a good while and it barely moved. Just amazing! That is one of the many things I have never done before having children, just stare at a bug? To think that God made that sweet creature. Fun stuff! Sounds like you had a good science/nature lesson that day. I can just see you getting on your hands and knees looking at that thing. Hee hee. I can hear the boys making all kinds of "whoa . . . and ohh . . ." remarks. Cute, Laurie.